What Lottie Dot’s resumé doesn’t tell you is that when she was only eight weeks old she was abandoned and almost froze to death in the snow. Patricia was working as a nurse in California at the time, and her son Stephen was driving out from Missouri for a visit. Patricia wasn’t thrilled about the idea. In fact, she was worried. It was the middle of February and winter weather can be extremely unpredictable. Stephen’s trip went smoothly until he reached Oklahoma and it began to snow. By the time he neared the small town of Catoosa, he found himself in the middle of a ferocious storm. Gale-force winds and slick roads made driving dangerous. The car windows fogged up and it was almost impossible to see. All of a sudden, Stephen saw something lying in the middle of the road. He swerved and brought the car to a screeching stop. He stepped out of the car to investigate, and suddenly then felt foolish. It was nothing more than a lump of ice and snow. Then it moved, ever so slightly. Stephen hurried over to take a closer look and could hardly believe his eyes. There, looking up at him, was a tiny puppy. She was frightened, malnourished and trembling from the cold. Stephen gently picked the puppy up and carried her to the car. He named her Catoosa, after the nearby town. He bought some milk at a gas station, then drove the rest of the way to California, feeding Catoosa and tucking her under his shirt to keep her warm. When Stephen arrived in California, he and Patricia took the puppy to the vet. Patricia was worried that Catoosa had wandered off and become lost, and that someone might be looking for her. The vet suspected otherwise. He gave her a BAER (brainstem auditory evoked response) test that measures hearing response and his suspicions were confirmed. Catoosa was completely deaf. The vet reckoned that a breeder had tested Catoosa, and when it was discovered she was deaf, had dumped her on the side of the road. He thought perhaps the breeder wanted to save the cost of having the pup euthanized, or they didn’t want word to get out that they’d bred a “defective” dog. Patricia and Stephen looked at each other in astonishment. How could anyone label this adorable little puppy as defective? So when the vet suggested using hand signals to train her, they readily agreed. Then they bundled Catoosa up and took her home to begin her new life. She felt it was fate that had brought Catoosa into her life and asked Stephen if he might let her keep the dog. Stephen knew how much this would mean to his mother, and that she would be more consistent with the training process. So rather reluctantly, he agreed. “It’s the most wonderful gift he has ever given me,” Patricia says. Patricia started training Catoosa right away. She still remembered the American Sign Language alphabet (ASL) that she had learned while in Girl Scouts, and used the letter “N” for no and “S” for stay. Other hand signals came naturally, such as holding up a finger to indicate “one minute” when she was going to leave the room. Catoosa grew more beautiful every day and her spots kept multiplying. This dainty pup loved to show off, prancing around the house in what Patricia jokingly calls her “lah-di-dah” way. One day, at a meet-and-greet outside a grocery store, a young boy with autism approached them. “Lotsa dots,” he tried to say, pointing to Catoosa’s spotted coat. But his words sounded like “Lottie dot.” For Patricia this was a “eureka” moment, and Lottie Dot became the puppy’s new name. When Lottie Dot was four months old, Patricia enrolled them both in a Canine Good Citizen (CGC) course, which is run by the American Kennel Club (AKC). The course focuses on both responsible pet ownership (like spaying and neutering, and cleaning up after your dog) and good manners for dogs. Because commands were given verbally, after each class Patricia went home and converted them to hand signals. Lottie passed the course two months later, an incredible achievement for such a young dog – and a deaf one at that! That autumn, Patricia was diagnosed with breast cancer (which is now in remission). Her life became a constant round of doctor’s appointments and radiation therapy. Patricia knew the nurses at the cancer clinic and they let her sneak Lottie Dot in to sit beside her during treatments. It made a huge difference not only to Patricia, but to the other patients as well. Lottie brought joy and laughter into an otherwise bleak world filled with tests, treatments and disease. She gave patients something to focus on and made time pass more quickly. Lottie seemed to have a sixth sense when it came to reading people’s moods. She knew when to be a jester and make everyone laugh, and when to just lie quietly on her blanket and be petted. The next year Patricia moved to Grand Junction in Tennessee to be closer to her mother. Grand Junction has a population of 315, and the small-town atmosphere, close community ties, and southern hospitality of her new home suited Patricia perfectly. Knowing the impact Lottie had made on her own recovery, Patricia wanted to take her to visit cancer patients at St. Jude Children’s Research Hospital in nearby Memphis. She made inquiries and learned that to be able to do this they would both have to be registered by Delta Society®, an international non-profit society that operates in 50 states and 13 countries worldwide. Delta Society sets standards for those wishing to participate in animal-assisted activities. It screens, trains and registers volunteers using a “both-ends-of-the-leash” approach that ensures both the owners and their pets are well-prepared. Lottie Dot already had her Canine Good Citizen Certification. However, in order to be a Delta Society Pet Partners® team, she and Patricia would have to go back to school. Patricia attended workshops and enrolled Lottie in a number of training courses. She used the same method as before; going to class with Lottie and then converting the verbal instructions to hand signals at home. Lottie was a quick learner. She soon passed not only the intermediate and advanced training classes, but a “tricks” class as well. But when it came time to take the Delta Society evaluation, which was needed in order to be registered, Lottie did not pass and was scored “Not Ready.” Twice! There was one particular hurdle that she just couldn’t seem to overcome. Patricia had to leave Lottie at one end of a long room, walk across to the other side, then turn around and call her. But Lottie was constantly distracted by the tester, instead of watching for Patricia’s hand signal. So she just stayed at the other end of the room. Patricia was undeterred and devised a plan. She practiced walking Lottie on a long leash around the backyard. Every time Lottie turned around and made eye contact, Patricia gave her a treat. It wasn’t long before she learned to “check in” with Patricia (and get a reward, of course) every 30 seconds or so. On the day of the third test, Patricia was nervous. She followed the same routine as she had before. She bathed Lottie, brushed her and trimmed her nails. She drove the one-and-a-half hours to the testing center. Then she registered Lottie, led her into the now-familiar room, and held her breath. Lottie sailed through the first part of the test. She sat, stayed and walked on her leash. She didn’t jump up on strangers and was comfortable around wheelchairs and canes. Then came the critical part of the test; Patricia left Lottie on one side of the room, walked to the other side, stopped and turned around. Lo and behold, Lottie was watching! Patricia gave the hand signal for come and Lottie responded immediately. She passed the exam! Patricia was understandably proud. These days, Lottie is incredibly busy. She visits St. Jude Children’s Research Hospital and various other facilities as well. At a veteran’s hospital in Memphis, she assists with physical therapy. Patients with mobility problems walk down the hall with Lottie, while she helps them keep their balance. When they take baby steps, she does too; when they take bigger strides she follows along. She also plays “catch” with patients confined to wheelchairs who need to develop upper body strength. They throw her weighted balls, which she happily retrieves. Lottie loves children and the feeling is mutual. On a visit to the Memphis Oral School for the Deaf, she put on a performance for a group of preschoolers. Always the show-off, Lottie balanced a bone on her nose, flipped it and then caught it in her mouth. She jumped through a hula hoop, played peekaboo by covering her eyes with her paws and – the children’s favorite – after every trick she took a bow! After the performance, Patricia asked how many of the children thought Lottie could hear. They all put up their hands. When Patricia told them otherwise, stillness settled over the room. They realized that Lottie was just like them, and she could still do amazing things. Nowhere is Lottie’s impact more profound than at children’s grief camps. These camps are specially designed for children who have lost a parent or close relative in the previous two years. The program combines games, singsongs, and activities that help the children explore their feelings and come to terms with their grief. She particularly remembers one boy who approached Lottie very timidly. His mother had died violently, and he had witnessed the event. He wanted to know if Lottie had lost her mother too. Patricia explained to him that Lottie didn’t remember, and he was fortunate to have lots of memories of his own mother that he was able to carry with him. Then Lottie, who had been watching, looked at the little boy as if she truly understood. He reached out, hugged her, and began to cry. On the last day of camp, children compose letters to their loved ones. These letters are attached to memorial balloons and released into the air. One little boy was having trouble putting his thoughts down on paper, but as he petted Lottie, he relaxed and started to write. He even asked Patricia how to spell certain words. “Those words will stay with me until the day I die,” Patricia says. With Lottie’s impressive array of accomplishments, it is no wonder that in Grand Junction and the surrounding area she is something of a celebrity. She receives cards and fan letters (sometimes left anonymously in the mailbox), thanking her for the work she does. She’s been featured in the local newspaper, and “Lottie Dot” cupcakes (with white icing and chocolate morsels on top) are sold at the bakery. The proceeds go to a special fund to help Patricia, who lives on a small pension, pay for gas so that she and Lottie can continue their animal-assisted activities. Lottie is also an honorary member of the Grand Junction fire department. She rides on their truck in the Christmas parade, and Patricia is teaching her to stop, drop and roll, so that she can demonstrate the life-saving technique to schoolchildren. With each new experience Lottie’s repertoire of hand signals expands. She now knows 40 different signals, from pay attention to play dead. And thank you. Patricia uses that one a lot. There’s a postscript to this story, and a happy one at that. 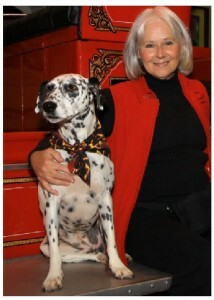 Patricia is getting another puppy; a beautiful, eight-week-old Dalmatian named Dora, who is also deaf! This particular breeder had been accustomed to euthanizing deaf dogs, but in the last litter a very special little girl had been born; one that she just couldn’t bring herself to put down. She searched for someone to adopt the pup and after learning about Patricia and Lottie Dot, she knew she had found the perfect home. Now Lottie has a new job to add to her resumé – big sister. And if her past accomplishments are any indication, it’s safe to assume she’ll excel at this, as well. Joanne studied Creative Writing at the University of British Columbia. 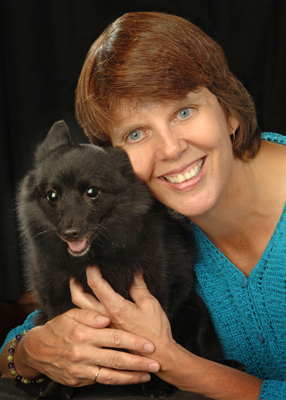 An experienced author, her writing credits include magazine articles in Dogs in Canada, Homemaker’s Magazine, and Canadian Living. Her first script, a mystery thriller entitled Obituary, premiered on Lifetime Television as a MOW (Movie of the Week) in July, 2006. The film, starring Josie Bissett (“Melrose Place”) and Alan C. Peterson, has since aired on the W Network and Global TV. Thank you for this very well-written touching story. I am sure Lottie will make a great big sister – she is obviously a very special dog.